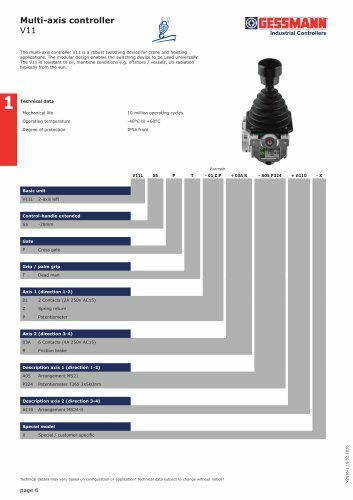 Industrial Controllers The multi-axis controller V11 is a robust switching device for crane and hoisting applications. The modular design enables the switching device to be used universally. The V11 is resistant to oil, maritime conditions e.g. offshore / vessels, UV radiation typically from the sun. I Technical data Mechanical life 10 million operating cycles Degree of protection IP54 front Basic unit V11L 2-axis left Gate P Cross gate Grip / palm grip Description axis 2 (direction 3-4) Special model Technical details may vary based on configuration or application! Technical data subject to change without notice! Industrial Controllers T = Dead man's button H = Signalbutton M = Latch for mechanical zero interlock Knob solid D= Push button Technical details may vary based on configuration or application! Technical data subject to change without notice!